If you are enrolled in the Blessings of Christmas Block of the Month, or have purchased a full kit, you will not need to purchase this item as it is included in the program. 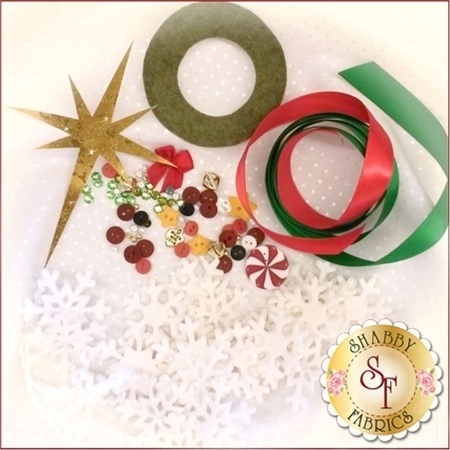 The Blessings of Christmas Embellishing Kit contains all of the pearls, rhinestones, beads, buttons, ribbon, and other embellishments needed to complete the Blessings of Christmas quilt! Save yourself the hassle of finding the perfect items to finish your quilt - these are the same embellishments used in the original quilt. Contains 101 pieces.